﻿The concept for the design was a natural, native, low-water garden with good structure and year-round interest. Lower maintenance and weed removal was also a goal. Structural shrubs (Black Chokeberry, Golden Currant and Grow-Low Sumac) and a tree(Piñon Pine) were to be added. A berm with moss rock boulders was also part of the design, lending a natural, alpine feeling to the garden. Construction started in spring of 2015, including removal of the weeds and many of the existing plants and installation of an automatic, low-water drip irrigation system in the bed. 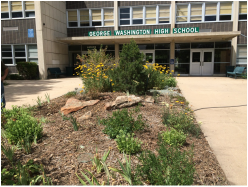 The work culminated at GW’s Go-Green day on April 11th, where over 80 volunteer students and adults planted the tree, shrubs and perennials, built the berm and placed the boulders. 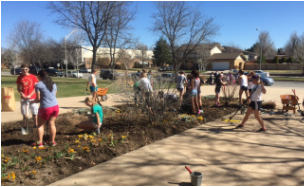 The garden is now thriving and is a beautiful improvement to the school for all to enjoy.